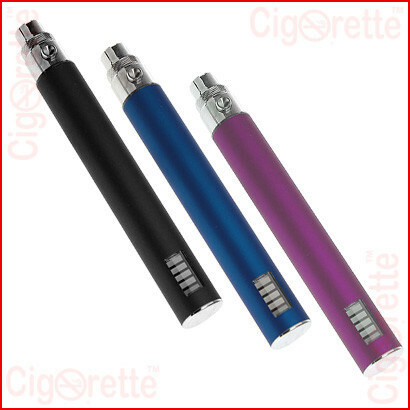 An eGo Style variable-voltage batteries that are available in two different capacities, 900mAh and 1300mAh. Each battery has a 0.55 inches LCD screen that shows the remaining battery power. 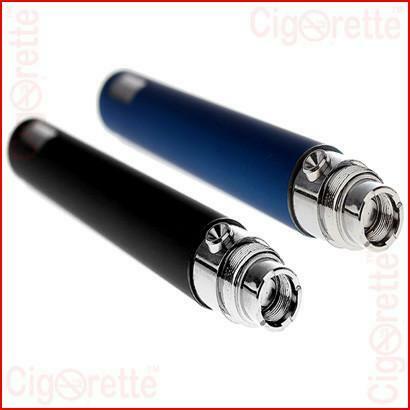 Also, has a modified circuit of adjustable 3.2 to 4.2 voltage outputs to enable the user to adapt different atomizers` resistances, calibrate the e-liquid taste, and to control the intensity of produced vapor. 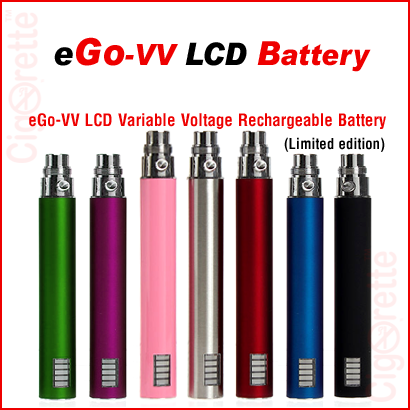 eGo-VV LCD Batteries: An eGo Style variable-voltage batteries that are available in two different capacities, 900mAh and 1300mAh. 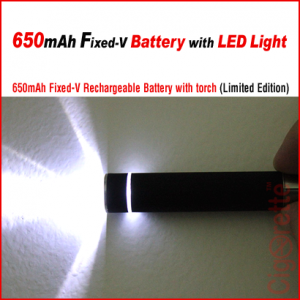 Firstly, each battery has a 0.55 inches LCD screen that shows the remaining battery power. 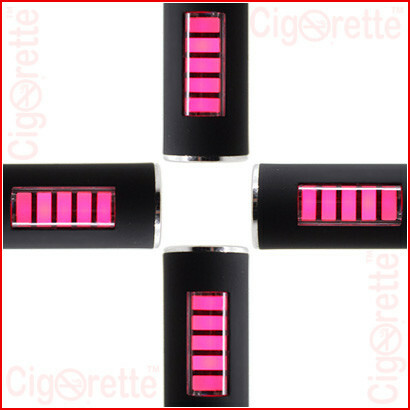 Also, there are 3-mode adjustable voltage outputs: the red light is an indication for 3.2V. 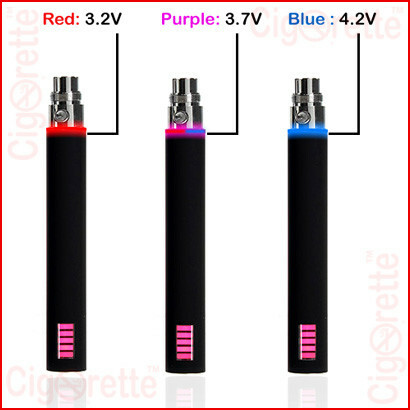 You may press the power button three times to increase the voltage to 3.7V which is indicated by the purple Light. Then, you may press three times furthermore to increase the voltage to 4.2V. That is shown by the Blue Light. Moreover, the red and blue flashing light is a warning for a short circuit. Also, the flashing red light is a warning for low power. 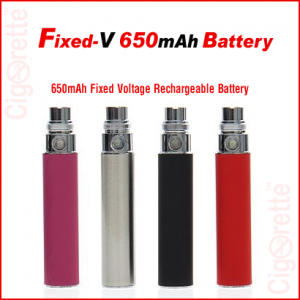 This variable voltage e-cig rechargeable battery has a modified circuit of different voltage outputs needed by the user to adapt different atomizers` resistances, calibrate the e-liquid taste, and to control the intensity of produced vapor. 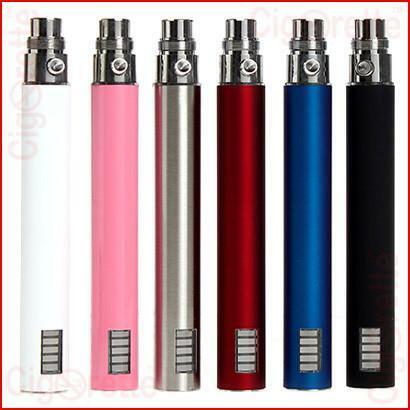 All eGo-VV LCD batteries feature 5 clicks on/off power control and have 510 threading connectors that make them compatible with CE4, CE5, CE6, Vivi Nova, Mt3, T3S, T3D, DCT, and tens of other atomizer brands. 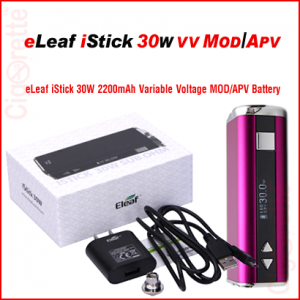 Hey Buddy!, I found this information for you: "eGo-VV LCD Batteries". 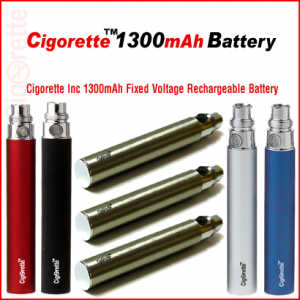 Here is the website link: //www.cigorette.com/shop/batteries/variable-volt-batteries-mods/ego-vv-lcd-batteries/. Thank you.